The Apple-1 sold for what was then the largest amount a personal computer had sold for at auction. 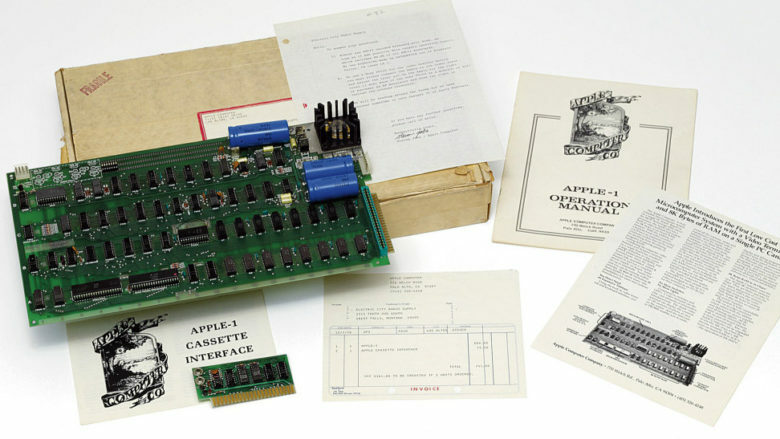 November 23, 2010: An early Apple-1 computer, complete with its original packaging and a letter signed by Steve Jobs, sells for $210,000. At the time the most expensive personal computer ever sold at auction, the working Apple-1 is thought to be one of only around 50 thought to still exist. The Apple-1 unit in question was sold to Italian businessman and private collector Marco Boglione, who owned an extensive archive of personal computers, including other rare Apple models. “I’m a guy that has been dealing with these machines, let me say loving these machines, and really being attached to these machines, since I was a kid,” sportswear company owner Boglione told The Seattle Times in an interview shortly thereafter. He announced that the Apple-1 was going to Italy’s Museum of the Information Technology Revolution, in his hometown, for display. Steve Wozniak was on hand for the Apple-1 auction, and informed Boglione that the machine was in good working order. At the time, much was made of the amount of money Marco Boglione had paid for the Apple-1. 2010 represented the height of Steve Jobs’ innovative run of hit products — with the iPad joining the iMac, iBook, iPod and iPhone as the products which defined Jobs’ second, legendary run at Apple. However, while the $210,000 sum paid for the Apple 1 was certainly a big increase on the computer’s $666.66 selling price in July 1976 (and around 10x more than you might have paid for an Apple 1 during Apple’s bad-old-days in the 1990s), it now looks like something of a bargain. Just four years later, in 2014, another Apple-1 computer sold at auction for an incredible $905,000, between twice and three times the expected asking price of $300,000 to $500,000. While that remains the most ever spent on the machine, it certainly suggests that Boglione got a good deal for the 8k of RAM and 8-bit 6502 microprocessor computer. Only around 200 Apple-1 units were ever built, and the number still around today is significantly smaller than that, due to both age and the fact that Apple offered a trade-in deal for the significantly upgraded Apple II when it was launched the following year in 1977.